Knee walls are a great way to open up a bathroom and make it look bigger. 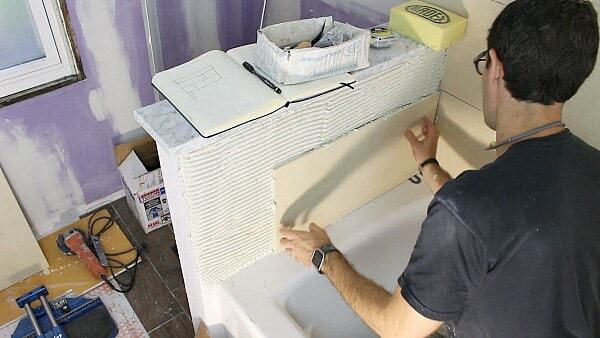 Small bathrooms in particular can benefit from this type of project. 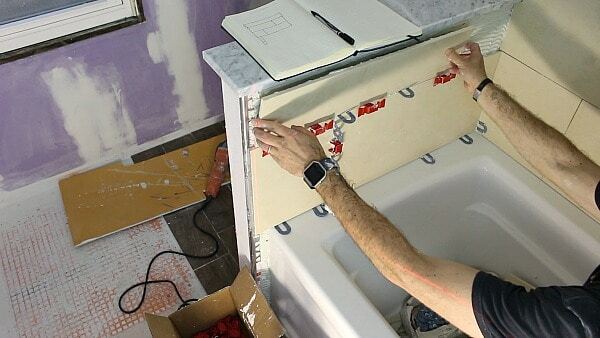 Today you’ll learn how to tile a shower wall, specifically the knee wall, and in the end be way more confident to tackle this project yourself. Rubber spacers are sold in most home stores. Stay away from these like their the plague. Rubber tends to flex and plastic doesn’t. 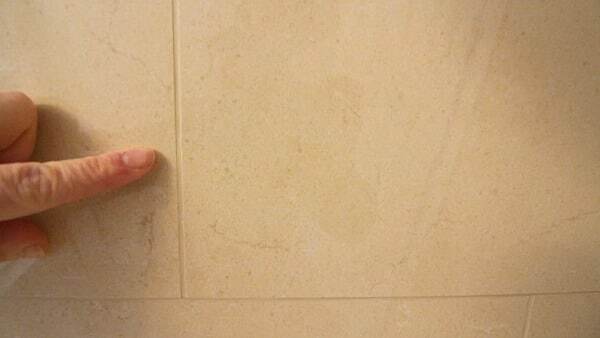 This general rule of thumb is important when setting tile because rubber spacers will lead to uneven grout joints. 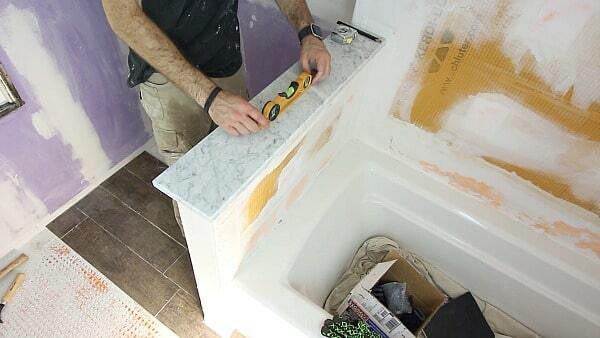 Place 1/16 or 1/8 inch plastic spacers on the tub and position your tile on top of them. 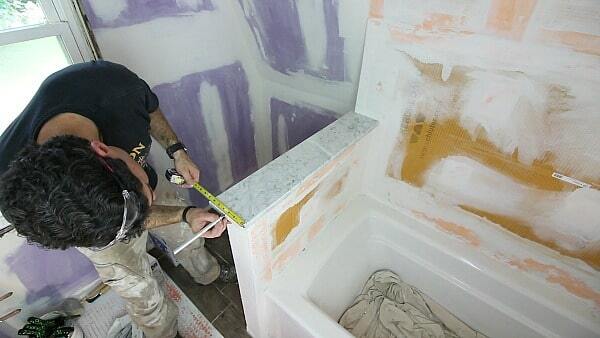 A small gap will exist between the tile and the tub. 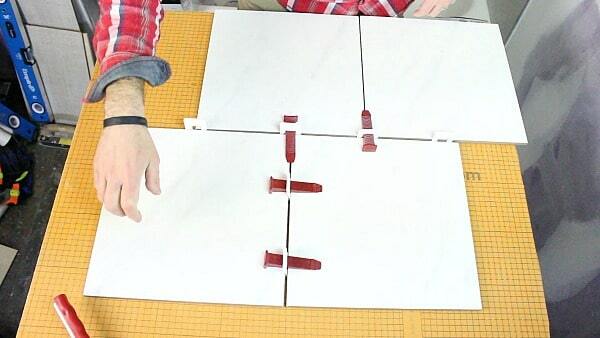 It’s an expansion and contraction gap which prevents tiles from cracking. Unfortunately I didn’t mention these next tips in my video. Laser levels can be used to level tiles as they’re set on the wall. It’s a bit subtle in the picture below but there’s a red line on the top of the tile – that’s the laser. Laser levels are better than ledger boards, which compromise the waterproofing, or pencil marks that get smeared by thin-set. Directional troweling is an absolute MUST for both the wall and the tile. All the trowel ridges face the same direction on the knee wall – this is called directional troweling. Back buttering the tile will improve its bond to the wall. The 12×24 inch tiles we used were heavy and I decided to back butter them. Sorry that I forgot to mention these tips in the video, but better late than never. Furthermore, apply adequate pressure and a slight up and down movement to the tile in order to collapse the trowel ridges. Collapsing the trowel ridges helps provide 100% thin-set coverage to the tile and improve the bonding between it and the waterproofing. Do you see the red things between the tile? 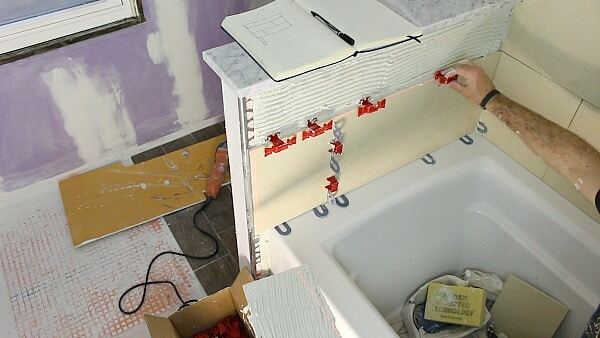 Those are the Tuscan SeamClips, a tile leveling system that prevents tile lippage. Some folks don’t believe in tile leveling systems. Other tile setters use them religiously. Tile isn’t straight or even on all the edges. 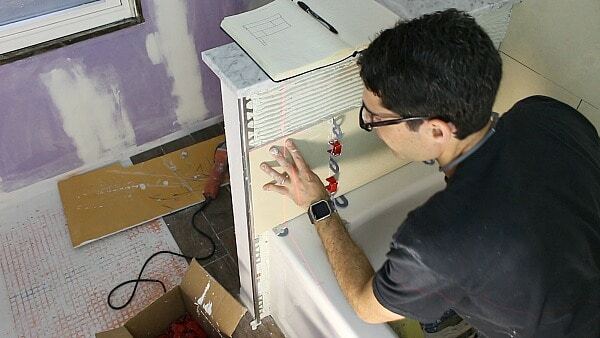 This is especially the case for large format tiles like the ones you see in today’s video. In addition, some tiles have a slight bow in the center which makes it difficult to align the edges of adjacent tiles. Tuscan SeamClips are placed two inches from the edge of tile and snapped into place. SeamClips are a tool, just like a trowel or tile cutter. 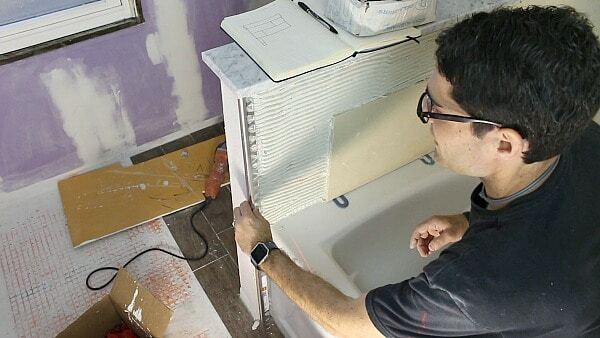 They’re meant to tune the tiles and help the tile setter achieve flat edge transitions. Plastic horseshoe shims, e.g. 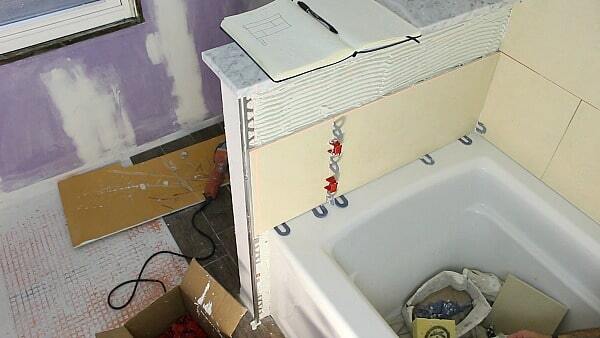 1/16 inch shims, can be placed between tiles to achieve a 1/16 inch grout joint. We’ve also been testing the T-Lock system by Perfect Level Master. My buddy Sal DiBlasi recommended T-Lock and frankly Sal is a tiling God. When he recommends something it’s best to take notes. Tile leveling systems are a small investment but well worth it. 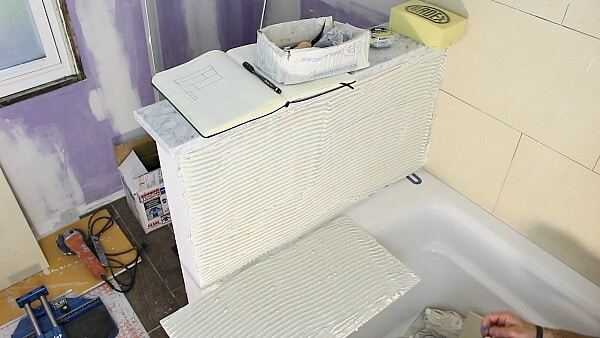 Tiles will be flat and even grout joints will be achieved. 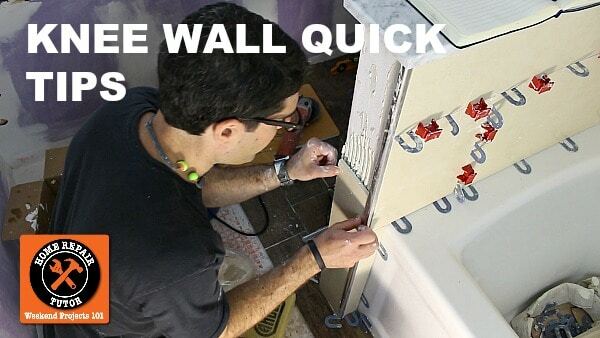 Marble is a great material for capping the knee wall. Again, I forgot to mention this in the video but slope the marble by 1/4 inch per foot so that water will drain from it. 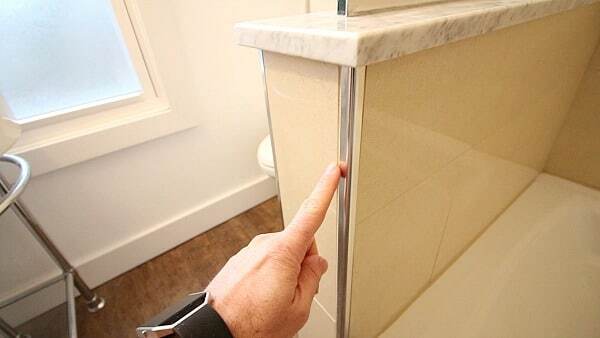 Furthermore, the marble should overhang the edges of the knee wall evenly on all sides. 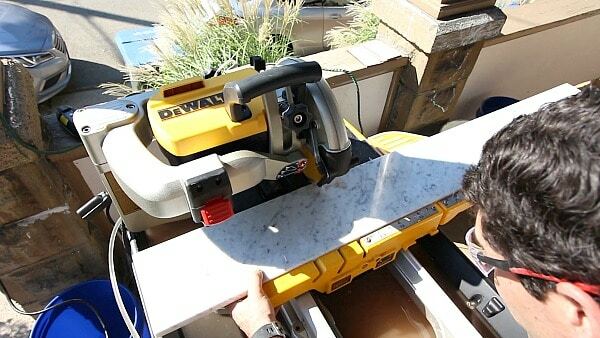 Most wet tile saws can cut marble. I used the DeWALT D24000 wet tile saw for this project. Four foot slabs of marble like the one in this bathroom cost about $100. Be careful when cutting the marble because mistakes can be costly. 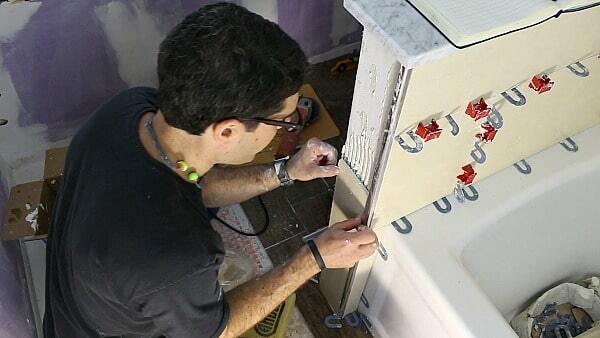 Bull nose tile is expensive and that’s one reason we like Schluter’s metal profiles. RONDEC is about $20 for 8 linear feet and comes in a variety or colors/styles. We used a chrome piece of RONDEC because all the fixtures are chrome, but it comes in a variety of finishes. 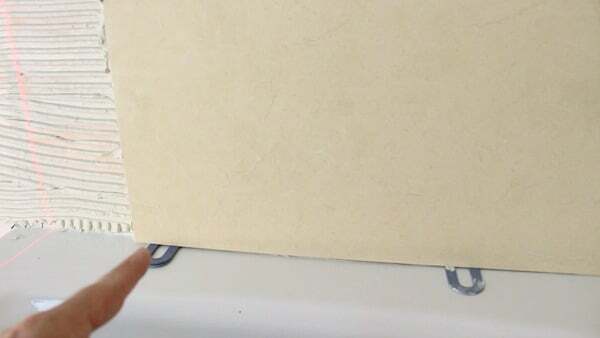 It’s common practice to set the RONDEC in thin-set then tile over it. We’ve also set the tile, packed the edge with thin-set, and slid the RONDEC behind the tile. It’s not a bad idea to have the RONDEC a little proud of the knee wall, i.e. stick out a bit more than the depth of the tile. That way, the tile can be back buttered to make it flush with the RONDEC. 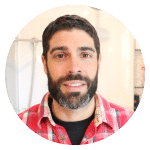 Watch our video for a few more tips – and to see what this shower looks like. Knee walls certainly make a small bathrooms look more spacious, especially when used with a glass partition. Thank you for this suggestion on the knee wall. It adds a lot to the overall appearance of the bathroom and adds some functionality as well. Great job and please continue to give us your ideas for the bathroom remodel. Is that a pane of glass over the marble slab? Did you tile on the toilet side of the pony wall? how do you install a shower curtain rod with a knee wall?